What helped me conquer the temptation to beat myself up over not having a spotless home? I embraced a new ideal: Done, not perfect. You accept that your home will never look perfect again–then, you do the next thing that needs to be done to keep it looking livable. Your kids somehow managed to scatter breakfast cereal in a 27-foot radius all the way around the dining table? Clearly, you need to vacuum. But that doesn't mean you have to move all the chairs to another room and pick up all the toys on the floor first. (If you do that, by the time you start vacuuming, they'll have tracked Cheerios all the way to the bedrooms!) Just vacuum through the toys and under the chairs–and while you've got the vacuum out, you might as well vacuum anywhere else that really needs it. Now, doesn't that look better? And it probably only took you about five minutes. Sure, it's not perfect. There's probably some bits of fuzz and little wads of paper hiding under those toys that are still littering the floor, but you did it. It's DONE, not perfect. Your toddler thought it would be fun to spew juice out of his mouth like some sort of bizarre fountain and then splash in the puddles? First of all, put him in the bathtub (but don't plug the drain or turn on the water yet, since you're going to have to leave him there for a few minutes while you clean up the mess so that your other children don't get any ideas about playing slip 'n slide in the orange juice while you're cleaning the toddler). Sop up most of the liquid with a towel, then grab a damp rag to wipe up any sticky residue, starting with surfaces that come into contact with food (tabletop and counters) and working your way down to the floor. (Okay, so the floor routinely comes into contact with food too, but that's not what I meant.) Resist the urge to mix up a bucket of that special mopping solution–you've got a toddler screaming for you from the bathroom. Besides, it's amazing how much you can accomplish with a wet rag. And since you're already on your hands and knees, give the kitchen floor a quick once-over with the rag, focusing on any spots that are visibly grimy. It'll only take you an extra 63 seconds or so–the toddler can wait–and when you finish, your kitchen mopping will be done. Not perfect, but done. I just want to interject here that I don't know what your mopping schedule looks like, but I no longer have one. It was too overwhelming to find an hour per week to mop the "right" way, so I gave up, and now I only mop as needed. But around here, we have kid-related food and beverage accidents often enough that I find myself on my hands and knees with a wet rag several times a week. It keeps our floors tolerably clean, even though I rarely bother to use anything stronger than water and a bit of elbow grease. Our floors are done, not perfect, and that's good enough for me. I think it's a great housekeeping motto. If you enjoyed this, please consider subscribing here. I would be honored to have the privilege of encouraging you on a regular basis! 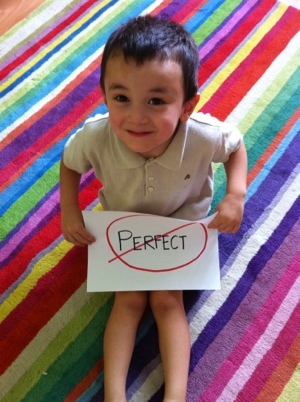 This entry was posted in Encouragement, Household Joys, Laughter and tagged housekeeping, perfectionism by Sharon. Bookmark the permalink. “Not tidy, but clean.” That’s a great motto too, because it’s pretty hard to keep anything tidy when the kids are awake! I guess I don’t have a big difference between everyday clean and Bible study clean, although I used to. I always try to keep things clean enough that I hope no one is going to be grossed out by a visit to the bathroom or a close look at our floors, because I never know when we might have an unexpected guest or invite someone over last-minute for an impromptu meal. However, about the only fanfare I do for Bible study days is hanging a clean hand towel in the guest bathroom and perhaps lighting a scented candle in there. If the kids don’t manage to get all their clutter put away before people start arriving, I don’t stress about it anymore. If the kitchen still hasn’t been cleaned from the meal that we all hastily tried to finish before that first person walked through the door, I’m no longer embarrassed by that. I’m not Supermom, and I’m okay with my guests knowing that. Sharon, Your home looked spectacular and sparkling clean for the mommy’s meeting last week. Thanks for having us. As I type this (from my kitchen table during breakfast) my kids are making their own messes. Shiloh is throwing egg on the ground and after Ethan protested that he didn’t want two different types of egg that we had cooked, he decided on cheese on bread dappled with sour cream. Hee hee! I guess you had your own opportunity for some spot mopping then! Sharon – love this! We are kindred spirits!! Well, it’s always nice to meet a kindred spirit! Thanks for stopping by and commenting!